Flip Out Mama: Awesome Halloween Contest from The First Years! You guys know what a big fan I am of The First Years and all their wonderful baby products, so I couldn't wait to share this great contest with you guys! They want to see pics of your kids in their costumes! 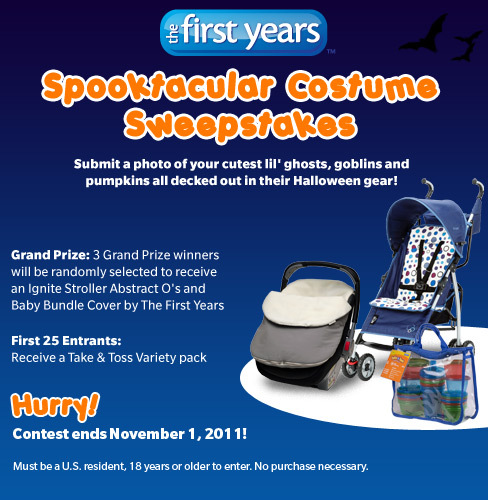 Three grand prize winners will be randomly selected to win a stroller and a car seat cover! And, that's not all! The first 25 entrants will win a 28 piece Take' N Toss variety pack! Make sure you hurry, because the contest ends on November 1st! !